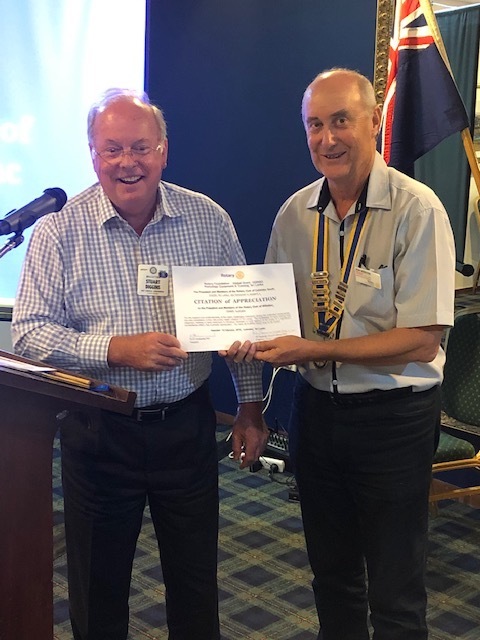 On Monday 25 March 2019 Club guest, Pip Asphar, from the Rotary Club of Osborne Park, spoke about his Club's long running project supplying superseded but completely serviceable hospital and medical equipment plus (where possible) other medical supplies, to hospitals in Cambodia. Over the last eight years Pip's Club has shipped thirty five (35) containers of equipment with an estimated value of $15 million. Pip is the Cambodian Project Manager. We report on his presentation below. 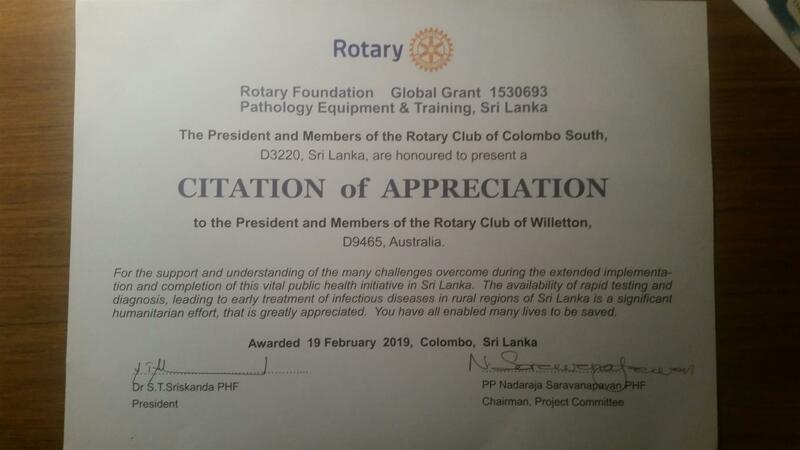 Continuing the international and health theme, it was with great pleasure and pride that the Club's Chair for Rotary Foundation, Stuart Diggins, and I accepted the Certificate of Appreciation (pictured at right) from the Rotary Club of Columbo South for our contribution toward the success of a Pathology & Equipment Training Program in Sri Lanka. It is reassuring to see what can be achieved with a Rotary International Global Grant and with Clubs in different countries working together. We've described the Grant system in detail beneath the certificate. Make an advance payment of $4,000 to the Rotary Foundation. Then at our most recent meeting on Monday 1 April 2019 our focus was the Willetton Rotary Community Fair to be held on Sunday 7 April 2019. Fair Chair, Simon Cubitt, briefed us on all the key aspects watched by special guest, Winsome English, attending with his father, Kieran; and Club friend and past Rotarian, Graeme Logan, who (as always) will be lending a very helpful hand. I thank everyone involved for getting the Fair to this final stage. The critical thing now is to have all hands on deck from 8.30am on Saturday morning; from 6am on Sunday morning; and for some to help finalising the loose ends on Monday. Last week we reported that the Willetton Senior High School (WSHS) Interact Club had reason to be very pleased and proud that they were one of nine finalists in the WA division of the Seven News Young Achievers Awards. Their category is the Youth Group Achievement Award sponsored by Woolworths. Since then the field has narrowed to four finalists, including the WSHS Interact Club. The winners will be announced at a Gala dinner to be held 25 May 2019. The Interact Club will also be out in force to help at the Willetton Rotary Community Fair and while at short notice, we couldn't reciprocate in numbers on Saturday 30 March, I thank Wayne Hand for representing us to help the Interact Club clear litter and weeds (which Wayne reported were very stubborn) from the east end of Adenia Road bordering Riverton/Ferndale, Bannister Creek in Lynwood. I also want to thank Paul Daly for the excellent job he has done to identify all the host families needed for the year our inbound exchange student, Johanna Lundblad, will be with us. The project began through a long-standing friendship between Rotarian Pip Asphar and his school friend, orthopaedic surgeon, Dr Tim Keenan. Tim had been assisting doctors in a number of overseas countries including the Kossamak hospital in Phnom Penh. Pip and Tim were having a coffee together discussing their interests. Tim shared his frustrations at seeing the Doctors in Cambodia having to work in very basic conditions with patients lying on mats on the floor.The Doctors were using antiquated equipment. In contrast the advances in technology and surplus in Australia sees hospital equipment being superseded and eventually taken to the rubbish tip. 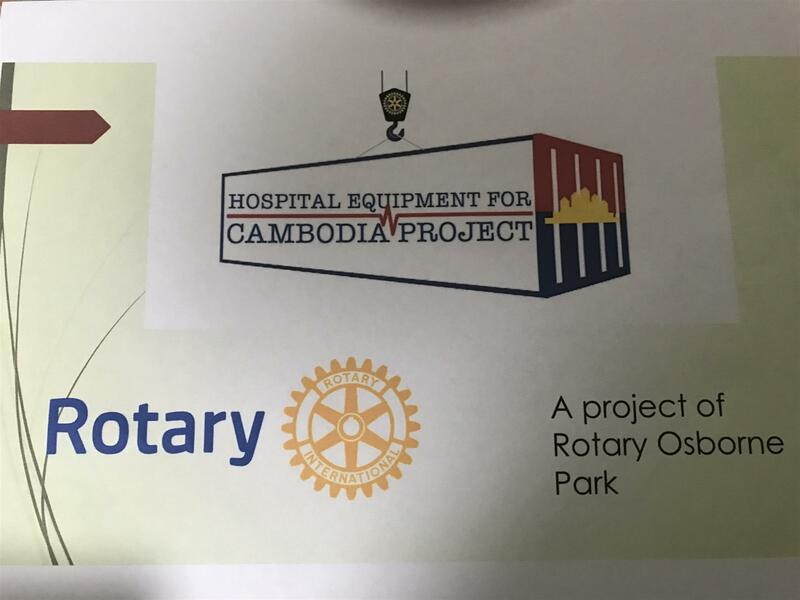 Through friends in Rotary contact has been made with a range of hospital engineers and others in Perth who were more than happy to organise the donation of surplus equipment from their storerooms to the Rotary Club of Osborne Park, which organised and funded the shipment to Cambodia. The Citation reads: "For the support of the many challenges overcome during the extended implementation and completion of this vita; public health initiative in Sri Lanka. The availability of rapid testing and diagnosis, leading to early treatment of infectious diseases in rural regions of Sri Lanka in a significant humanitarian effort, that is greatly appreciated. You have all enabled many lives to be saved. " Humanitarian projects addressing community needs by providing sustainable, measurable outcomes in the benefiting community. Vocational Training Teams (VTT) builds skills within a community by offering local training or by supporting groups of professionals traveling abroad for rigorous study in their profession or to teach local professionals about a particular field. This type of training may be most effective in conjunction with a humanitarian project. The minimum funding size of a Global Grant is between $30,000USD and $45,000USD and is determined by the project funding mix and a required minimum $15,000USD Foundation match.